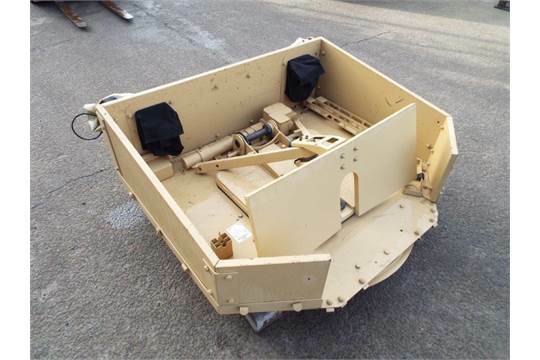 You are bidding on an Armoured Vehicle Weapon Turret Assembly with Cover. It is sold as seen and has not been tried or tested by us . There is no warranty. PLEASE NOTE THIS LOT WILL REQUIRE A FULL EXPORT LICENCE IF SOLD OUTSIDE OF THE UK AT A CHARGE OF £300 PER VEHICLE. PLEASE NOTE THERE IS A 10% BUYERS PREMIUM ON THIS LOT. PLEASE NOTE ANY MILITARY ITEMS WILL REQUIRE A FULL EXPORT LICENCE IF SOLD OUTSIDE OF THE UK AT A CHARGE OF £300 PER ITEM.